Need a little lift? These cheery candles perk up the room with festive color and the delightful fragrances of two summertime classic treats: Cinnamon Apple and White Lemonade. 30 hours burn time. Weight 1.5 lbs. 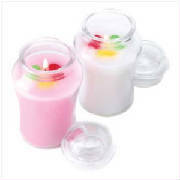 Paraffin wax; glass container. Each is 2 1/2" diameter x 4 1/2" high. Pair. The sweet scent of romance turns any day into a Valentine’s celebration! This twosome of sentimental scents instantly enhances any setting with an amorous glow. 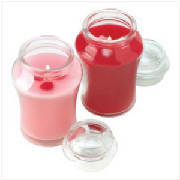 One each Rose Vanilla and Red Wine fragrances. 30 hours burn time. Weight 1.5 lbs. 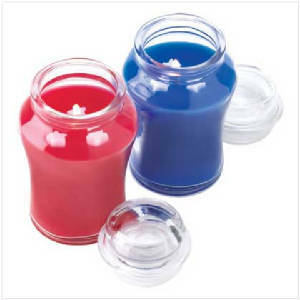 Paraffin wax; glass container. Each is 2 1/2" diameter x 4 1/2" high. Pair.